We have 2 types of ceramic bearing, hybrid ceramic bearing and full ceramic bearing, the hybrid ceramic bearing has steel inner and outer rings with ceramic balls, as for the full ceramic bearing; the inner, outer rings and the balls are made of ceramic. There are many kinds of ceramic materials, the most common ceramic materials are Si3N4 that stands for the silicon nitride ceramic material and is black colored, SiC stands for the silicon carbide material and also is black colored. and the ZrO2 that stands for the zirconium dioxide, also known as zirconia or zirconium oxide, they are white colored, a ZrO2 ball looks exactly like a pearl. the ceramic material is not stronger than steel, but ceramic bearing are lighter and have lower friction than steel, that makes ceramic bearing go faster with lower heat generated. Conventional all steel bearings limit design potential as technology requirements roll forward at a fantastic rate. 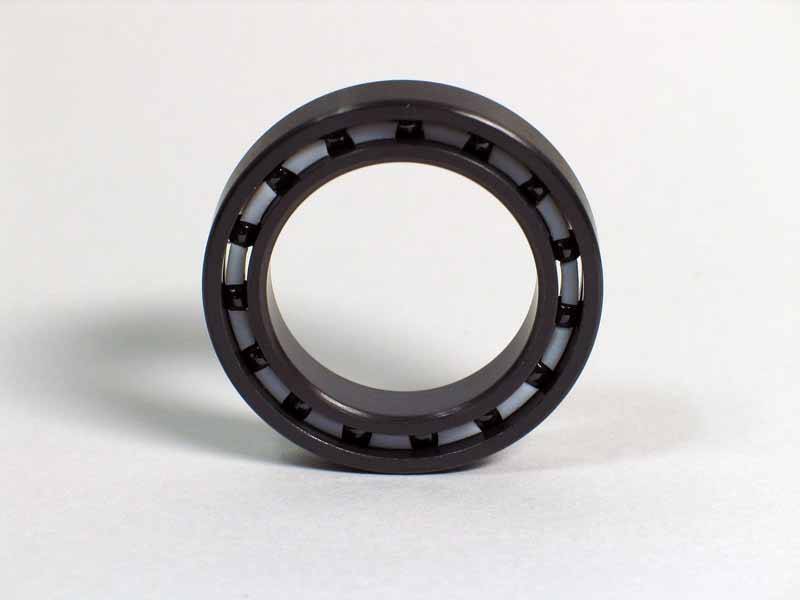 Ceramic Hybrid bearings using Silicon Nitride balls (Si3N4) meet and exceed today's high tech requirements, offering a long list of characteristics far superior to that of conventional all-steel bearings. Its lighter, smoother, stiffer, harder, corrosion resistant, and electrically resistant. These fundamental characteristics allow for a wide range of performance enhancements in bearings. Ceramic Balls are particularly well suited for use in extremely harsh environments where high temperatures or corrosive and erosive substances are present. * Silicon nitride bearings (Si3N4) Series: A new material suitable for applications where high loads, high speeds and extreme temperatures are factors. Long life and the need for minimum lubrication makes this material perfect for harsh conditions. Si3N4 is anti-magnetic. Maximum useful temperature is 2552F. * Zirconia bearings (Zr02) Series: Inert to corrosive materials, with the exception of hydrofloric acid and hot concentrated sulfuric acid. Maximum useful temperature 1800F. You can see the complete Bearings Tables of our products here. 1,is it possible to print a logo on the cover (see attachment) of one side of the plastic cover of the full ceramic bearings? If you need Full Ceramic Bearings,sorry that we can not print letter on the cover, only may print in the rings. 2,We are designing a flywheel system for power storage to use it for a mobility solution, rotating at 40,000 rpm and weighing approximately 5 kg.We are interested in your ceramic bearing for radial and axial load. We are interested in the size of internal diameter 6-16 mm. We would also know the price for an amount of 2000 pieces for the axial and 2000 pieces for the radial.We would like technical advice or clarification from you in this regard. You may see the following catalog of deep groove bearing radial and angular contact bearingsc. which type do you want ?